Brian Webb graduated with distinction from the University of Alberta with a Bachelor of Fine Arts in Theatre. He then moved to New York City, working with Eric Hawkins who had an influence on his early dance making. During the 1970's, Brian premiered many of his first dances with the Carol Conway Company in New York. 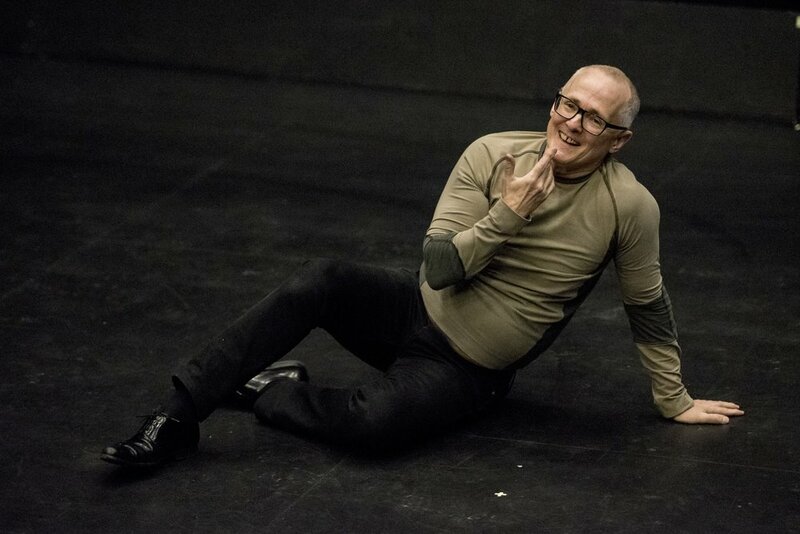 Returning to Edmonton in 1979, he formed the Brian Webb Dance Company as "company in residence" at Grant MacEwan College, where he was the Chair of the Dance Program for ten years. The company began presenting dance seasons in 1991. Since the beginning, the BWDC has been dedicated to experimentation, the new, and a collaborative creative process. His company has commissioned over 40 musical scores, numerous installations by visual artists and scripts by writers. Brian collaborates with local artists and works to give their work a broad context by tours across Canada and abroad. In 1986, Brian completed a master of Fine Arts degree in Choreography at the California Institute of the Arts. He returned to Edmonton and began to create a solo dance theatre repertoire that presented a series of self portraits in collaboration with artists of contemporary media. During this period, he created numerous works with Edmonton visual artist Blair Brennan. These works toured across Canada to Vancouver, Calgary, Toronto, Ottawa and Montreal. Brian believes in collaboration being the democratic exchange between individuals to make something new. This exchange includes the audience he has developed in Edmonton as a presenter of new dance and interdisciplinary art. His works tour Canada regularly. His collaboration with Jeff McMahon, The Mountains and the Plains, toured to New York and numerous Canadian centres. His 2009 work, The Effects of Sunlight Falling On Raw Concrete, has been performed in Edmonton, Calgary, Regina, Toronto and Ottawa. The piece was created in collaboration with local artists, Dave Wall [composer] David Fraser [Designer], and Nancy Sandercock [dancer]. Eleven local artists participated in the performance. In 1995, Brian was awarded the Syncrude Award for Innovation in Artistic Direction and in 1998 he won the Telus Award for Arts of the Future (for Project Desire: The Mountains and the Plains). He was selected as an interdisciplinary artist in the 2000 Alberta Biannual of Contemporary Art. His dance, I'm Standing Here Before You, was performed in 2005 at the National Arts Centre's Alberta Scene in Ottawa. Brian has been inducted into the Edmonton Cultural Hall of Fame (2002), and received the Queens Jubilee Medal (2002) the Alberta Centennial Medal (2005), Univeristy of Alberta Alumni Award and the Queens Diamond Jubilee Medal (2012). Brian's reputation extends nationally and abroad. He is known as an artist, teacher and dance presenter. In 2009, he taught creative process to emerging contemporary South Asian dance artists from Canada, US, UK, India, Singapore and Malaysia. As Artistic Director of the Canada Dance Festival at the National Arts Centre (NAC) in Ottawa from 2001 to 2011, he introduced much innovative programming. In HipHop 360 , he introduced bboying [break dancing] to the NAC to huge success and impact. In 2009 he presented Dancing In, Through and Between Cultures, a festival and symposium on diversity in Canadian culture. People from Aboriginal and culturally diverse communities participated in a dialogue that was not afraid to discuss racism in Canadian arts. Brian also works in the community as a volunteer. He was the president of Latitude 53 and Professional Arts Coalition of Edmonton [locally], the Alberta Dance Alliance [provincially], and the CanDance Network [nationally]. He has served on the boards of the Compassion House Foundation [7 years] and the Nina Haggerty Centre [2 years]. He was the co-chair of a City of Edmonton initiative examining the future of the arts and arts policy in Edmonton. He was on the board for the Edmonton Arts Council for 5 years and was its Chairperson for one term. He believes that artists must be active participants in the community at large. My interest is in contemporary dance creation that strives to place the individual's experiences as it relates to culture, diversity and contemporary arts theory as a dance presenter. In general, I am amazed by the power, the originality, the freedom and the relevance of contemporary dance creation. Dance communicates through the inner body when the choreography and the interpretation of it are equal partners. The dancing and the dance are one in the same. My interest is in dance that communicates from the body of today; that is aware of thought as it relates to contemporary art making practice in the broadest sense; and at the same time reveals its own authenticity. As a curator, I believe it is my responsibility to contribute to the building and maintenance of a positive atmosphere for creation where artists are able to take risks. I believe that I may impact an audience to more fully appreciate contemporary dance. The development of an art form must not be isolated from the development of an audience who feels empowered to respond to it. I am interested in dance becoming a stronger element of Canadian culture. In my curation, I focus on the individual's potential as a person, whether they are a creator of dance, an interpreter of dance or a viewer of dance. Bohater (collaboration with composer George Arasimowicz) was performed at the 13th International Festival of Electronic Music at the Oberlin Conservatory of Music in Oberlin, Ohio, U.S.A.
Project Desire/the mountains and the plains with Jeff McMahon, premiered in Edmonton with performances in Vancouver and Calgary and then Vancouver, Toronto and New York. A Summer Evening…seems to be at the heart of the affair collaboration with dancer/choreographer, Tania Alvarado, dance with large format video - performances in Edmonton, Vancouver, Toronto. Sacred Time - solo version, with guests and collaboration with DJ Echo. Interdisciplinary performance with large format video. I'm Standing Here Before You - music by Alfred Schnittke; performed in Edmonton and Ottawa. A Love Story – with Tania Alvarado, Adriana Davies, Haley Simons and Tim Folkman. Nine Points to Navigate – with Sheri Sommerville; performed in Edmonton and Vancouver. The Effects of Sunlight Falling on Raw Concrete – with Nancy Sandercock; performed in Edmonton, Vancouver, Calgary, Regina, Toronto, and Ottawa.